Jepara - Chairperson of the Regional People's Legislative Assembly (DPRD) C H. Sunarto, S. Sos received a labor hearing of the Federation of Indonesian Metal Workers Union (FSPMI) in the complete Jepara district and FSPMI in Central Java, Monday (07/01/2019). The hearing was a follow-up of the hearing request letter that had been submitted by the Federation of Indonesian Metal Workers Union (KC FSPMI) Semarang Raya on Friday (04/01/2019) to the Chairperson of Commission C DPRD in Jepara Regency. Taking place in the C commission room of the Jepara district DPRD office, FSPMI workers expressed about procurement and implementation of District Sectoral Minimum Wages (UMSK) for Jepara Regency. UMSK itself is the minimum wage that applies in one particular city / district, which applies specifically to certain industrial sectors. Not only from the ranks of the DPRD and workers of FSPMI in Jepara district, the hearing that took place this morning was also attended by parties from the Manpower and Transmigration Office (Disnakertrans) of Jepara district and representatives from the All Indonesia Workers' Union (SPSI). Yohanes Sri Giyanto in his audience explained his gratitude for the facilities that had been given and expressed the wishes or aspirations of the workers in Jepara. "Regarding the improvement of workers' welfare, we want to convey what is the desires and expectations of workers in Jepara Regency, namely the procurement and implementation of UMSK for Jepara district. Considering the large number of industrial sectors and MSMEs in Jepara. 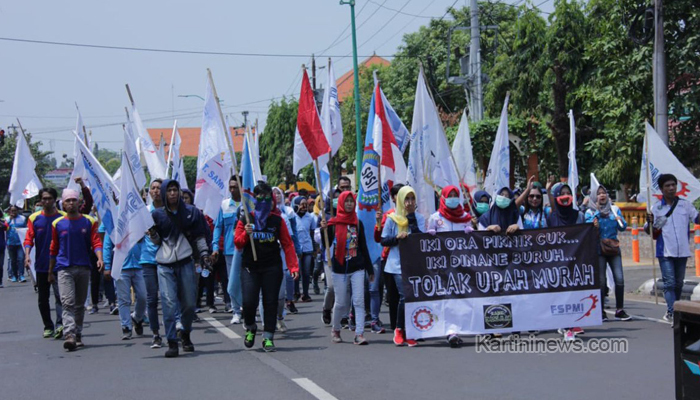 This is the basis for us (laborers) Jepara to ask for fair wages. And regarding UMSK itself, it is actually clearly stipulated in Article 13 paragraph 1 of Minister of Manpower and Transmigration Regulation No. 7 of 2013. "said Yohanes Sri Giyanto, chairman of FSPMI, Jepara district. Eko Martiko The Jepara District Wage Council (DPK) from FSPMI's labor element also conveyed that the purpose of this hearing was to create a fair Jepara district wage system by implementing and implementing the UMSK. Considering Jepara district itself is like a magnet that has an attraction for foreign investors. "For legislation regarding UMSK itself has been clearly regulated, but its implementation in Jepara district itself does not yet exist. "The existence of UMSK can be used as a solution to maintain the sustainability of the MSME industry in Jepara district which began to erode as labor-intensive industries / companies arrived," Eko Martiko added. From what was presented by the workers, received a good response from members of the DPRD C commission with parties from the Manpower and Transmigration Office (Disnakertrans) Jepara district. Syafudin, member of Commission C, Jepara Regency DPRD appreciated and provided support regarding the proposal to procure UMSK in Jepara district. He said that the proposal of UMSK could be a solution to maintain the sustainability of the many industrial sectors in Jepara. He also appealed to the government firmly against rogue companies in Jepara that violated labor laws, not to let the government lose its role. Likewise, Trisno Santoso as head of the Manpower and Transmigration Office (Disnakertrans) of Jepara district will immediately coordinate the meeting of the Jepara Regency Wage Council (DPK) to discuss UMSK. "In the case of UMSK, there must be an agreement between the businessman and the party from the union and the forum for discussion in the Regency Wage Council meeting. As soon as possible, I will coordinate the members of the wage council to conduct a meeting on UMSK after we Disnaker has finished carrying out MSE socialization in 2019. We will facilitate the meeting, "said Trisno Santoso.